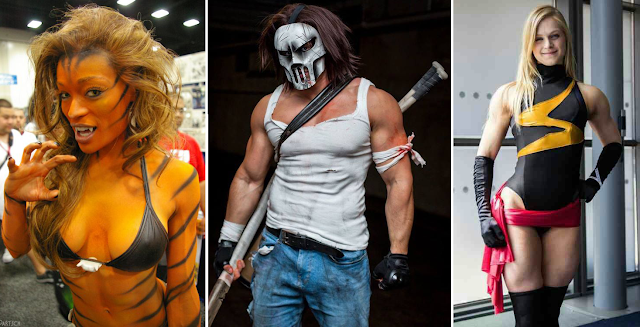 It's A Dan's World: NOW COMES THE COSPLAYER: Thanos, Casey Jones, Tigra and More! NOW COMES THE COSPLAYER: Thanos, Casey Jones, Tigra and More! Taken by DTJaaaam at San Diego Comic Con 2015, this is a Masters of Evil line-up we need to see! No more 'Masters of Evil' where small fry criminals are in the mix. Let's see an all-star M.O.E! Actually I see an all star moe each time my mates mother in-law walks in the room, but that's another story. Today's story is COSPLAY - and there are more crazy cool costumes right on the very next page - so click through now. Any person cosplaying as a member of the West Coast Avengers instantly gets my vote, and Tigra is no exception! Self-proclaimed 'booty guru' Alicia Marie must be signing up fans to the character with each step she takes. Why Tigra is such an endangered species in terms of Marvel comic appearances, I'll never know. Speaking of the unsung, Casey Jones was always the best part of the Teenage Mutant Ninja Turtle franchise, and I always thought a sports club-weilding vigalante would quickly be 'adopted' by one of the big three publishers (maybe this shows why I'm not a comics editor)! But just look at here 'King of the North' - tell me that cosplay doesn't show the character has huge potential - he's as relatable as you can get! Ms. Marvel has had her name and costume change for so long now, it's pretty clear it's not going anywhere. Which is a shame, as her former duds really were a classic superhero outfit, screaming 'Avenger' and 'wow' in better doses than the current space inspired look. Still onwards and upwards, at least we have the talents of cosplay to remind us of how wow her classic look was! Thanks Dale - I agree. I think I would go everywhere in that DOOM suit and I mean everywhere! Dude me too. And I'd take Stan Lee's advice, and go up to a cop and announce that you threaten to take over the world.Well, maybe not in a post 9/11 world, but yeah, fun.